He had only arrived in Los Angeles late the night before, but he was full of energy. 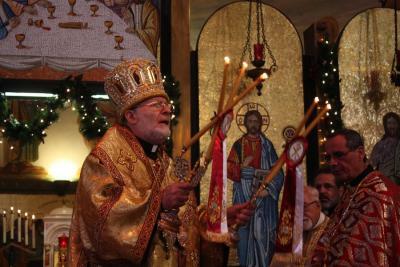 His Eminence Metropolitan Joseph celebrated the feast day of St. Nicholas with his "family" at what has been his west coast cathedral and home for twenty years. Sayidna Joseph had just returned from the other side of the globe, visiting the Antiochian Orthodox Christian communities of St. George in London (which Sayidna founded as a priest in the 1980s), and St. Nicholas in Abu Dhabi. The latter community pleaded with him to stay for St. Nicholas Day, but he told them he had a promise to keep in Los Angeles. At the conclusion of Orthros, Sayidna Joseph and the clergy offered Trisagion Prayers for his Father-in-Christ and mentor, His Beatitude Patriarch Ignatius IV, upon the three-year anniversary of his repose; and for Mr. Joseph Chammaa (six months), a longtime member of St. Nicholas. Fr. 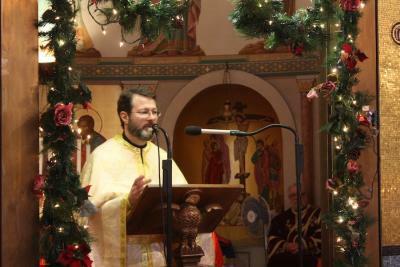 Calinic offers the homilyDuring the Hierarchal Divine Liturgy, Sayidna Joseph introduced Fr. Calinic Berger as the cathedral's new assistant pastor. He joins the dean, Fr. 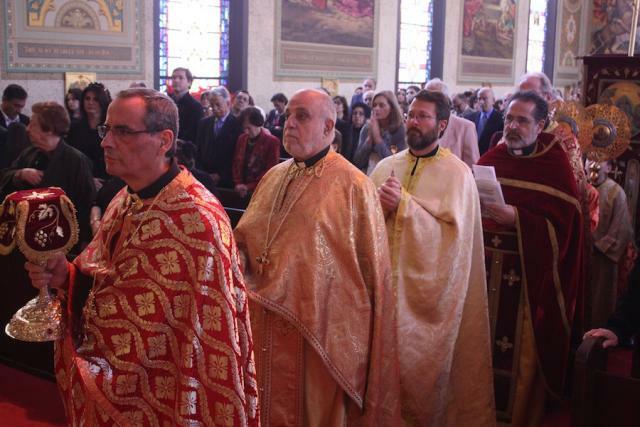 Michel Najim, and the other clergy to minister to the faithful. Sayidna put Fr. Calinic to work right away by having him preach about the fourth century Archbishop of Myra in Lycia. Father Calinic cited a 2014 study in which an Italian researcher produced a digital reconstruction of the wonderworker's face from his relics. It almost perfectly matches the image that the Orthodox Church keeps in icons of St. Nicholas. This, and all of his miracles from ages past until now, show how powerfully St. Nicholas endures as an intercessor. 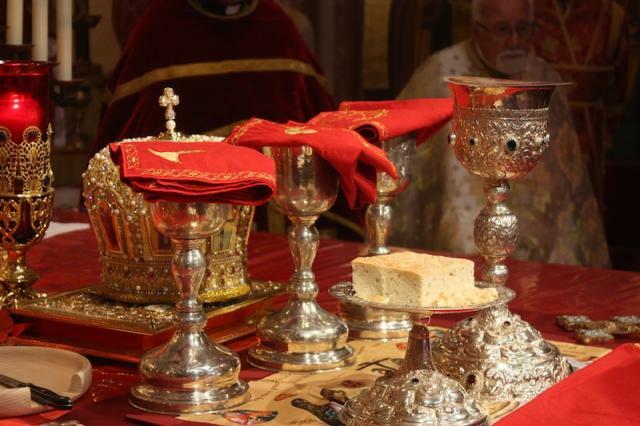 Father and Khouria with SayidnaIn the luncheon that followed, Sayidna Joseph reminded the clergy and faithful to emulate St. Nicholas, who in turn emulated our Lord, God and Savior Jesus Christ, even in a turbulent world. "He didn't use evil as others did," Sayidna said. "He used his virtuous lifestyle to help other people, and rescue them from dangers. Today is not a worldly celebration of St. Nicholas. We have to be impacted and influenced by him. He is for all of us a rule of faith and an icon of mildness." Saint Nicholas came from a family with great wealth, but as Sayidna Joseph said, "St. Nicholas praised and thanked God through his wealth and saved lives." Mrs. Nadia Nassif receives her awardAs is tradition, attendees were treated to the beautiful voices of Miss Diana Taweel and Miss Jessica Mamey. They sang Christmas carols composed by Jessica's father, Mr. Norman Mamey of blessed memory. He had coordinated and emceed the St. Nicholas Day festivities for many years. 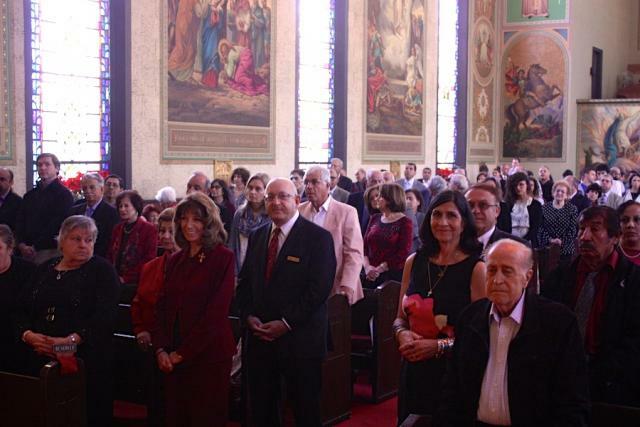 Then, Mrs. Carole Ouejian and Mr. Alberto Fayad chanted in Arabic hymns from the Nativity of Christ. 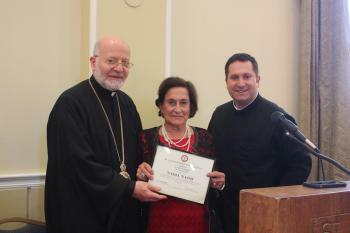 Saint Nicholas Cathedral honored six lifelong members for their leadership and contributions to the community they love: Mr. Julian Capata, Mrs. Nadia Nassif, Dr. George and Mrs. Maha Madanat, Mrs. Nina Fayad, and Mrs. Leila Beebe. Sayidna Joseph thanked God for these honorees and singers, and for their commitment and good example.